The idea that plants need animals as much as animals need plants is counterintuitive to those trained to think nature consists of disconnected parts which can be independently manipulated. But, holistic thinkers have always said that nature’s individual parts are interdependent. As any gardener knows, pinching back flowers to create bushier plants works for the same reason that mowing grass creates a lawn. These insights – which appear lost to modern agriculture and academia – are as fundamental to holistic grazing and wildlife practices as they are to home gardening. If plants could be stars in a cowboy film, the scarlet gilia would be one of the meanest wildflowers west of the Mississippi. You can find it standing tall among the sagebrush on mountainsides, its red flowers blazing. Drought can’t always stop it. Shade won’t faze it. And when mule deer and elk start grazing on it early in the season, it comes back bigger and stronger, with more defenses and a posse of new plants. Biologists call outlaw plants like this the overcompensators. In the study published this month in the journal Ecology, scientists showed for the first time that in an experiment, damaging some plants set off a molecular chain of events that caused them to grow back bigger, and produce more seeds and chemical defenses simultaneously. At the genetic level, the two tactics for plant survival worked hand in hand — at least in Arabidopsis thaliana, a kind of mustard plant often used for research. Ken Paige, an evolutionary ecologist also at he University of Illinois and principal investigator of the study, first observed overcompensation in the scarlet gilia in 1987. He described plants that would make more flowers, stems and seeds when their main stems were cut off or eaten. At the time, being eaten was believed to be bad for plants — always. It took a decade’s worth of seeing the contrary for other biologists to believe it. Dr. Paige started looking for a molecular mechanism behind overcompensation in some versions of Arabidopsis. As he damaged their main stems, he started seeing indications that not only did they get bushier and produce more seeds, but they also ramped up their chemical defenses. At one point in time, theory pitted regrowth, also known as tolerance, against defense: with limited energy, a plant had to pick one or the other. But in the past decade, more researchers can’t find a trade-off, said Anurag Agrawal, an ecologist at Cornell University who studies plant-herbivore interactions and was not involved in the study. Dr. Paige thinks a special process at the molecular level helps plants that overcompensate employ both strategies. 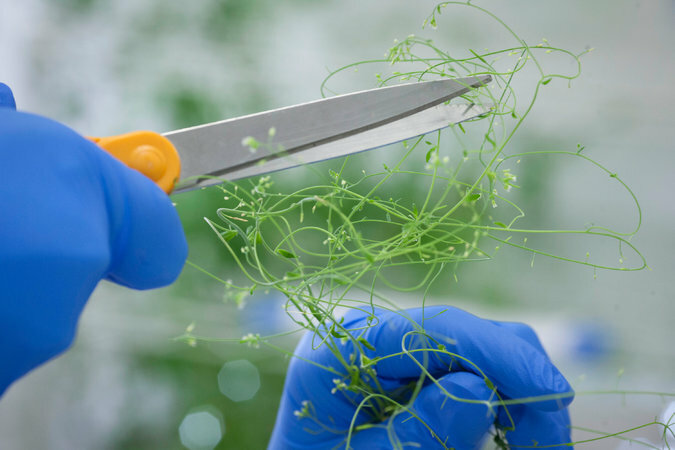 Most plants respond to damage with a process called endoreduplication, in which a cell can copy its DNA over and over without splitting into two cells. This gives the plant bigger cells with multiple energy factories to accomplish a variety of tasks. Many damaged plants only show minimal levels of endoreduplication. But the overcompensators go into overdrive with the process. In the case of the study’s mustard plants, they were able to grow bigger and also produce glucosinolate, the sulfurish, bitter chemical compound in mustard, kale, cabbage and horseradish. And the new research finds that when it comes to building up tolerance or defenses, for at least some plants, you can’t have one without the other. But even the baddest cowboys are not immortal, the researchers found. If they cut the main stem and 75 percent of its leaves, even overcompensators can’t rebound. This tough guy tactic may be a special case, said Dr. Agrawal, but Mr. Mesa and Dr. Paige think it could be generalized to many other plants. Depending on much that turns out to be true, future research could one day help farmers grow super crops that made more food without having to use as many pesticides. But as the story often goes for basic genetic research on crops, results that could be applied are a ways off.